Born Milwaukee, Wisconsin, November 23, 1970; married, 3 children. Graduate Wauwatosa West High School, 1989; attended University of Wisconsin–Milwaukee and University of Wisconsin–Oshkosh. Member: Realtors Association of Northeast Wisconsin; Wisconsin Realtors Association. Town of Vandenbroeck supervisor, 2005–07; town chair, 2007–11. 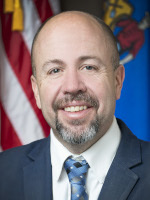 Outagamie County supervisor, 2006–11. Elected to Assembly since 2010. Leadership positions: Majority Leader 2017, 2015; Assistant Majority Leader 2013.